Galaxy Warrior is a modern space shooter game with spectacular 3D graphics and effects. Guide your ship through the vastness of space destroying menacing aliens and powerful bosses. Feast your eyes with incredible slow motion effects, explosions, lighting and other dynamic elements. Collect coins and use those to buy a better ship or upgrade your existing one. Unlock Google Play Achievements and access the online leaderboard to see who’s a better space shooter. Classic SHMUP Gameplay. 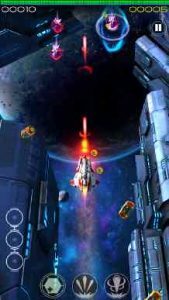 Galaxy Warrior features a modern take on the classic vertical shoot`em up genre, where you control a spaceship and shoot at incoming alien ships. Easy one-finger game control. Stunning Graphics. Breathtaking graphics depicting a futuristic space-themed 3D world with unbelievable visual effects. Fight against menacing looking powerful Bosses while enjoying stunning artsy graphics. Multiple ships & upgrades. Collect in-game coins to afford more powerful ships with better armor/shield/damage. You can also upgrade your ship’s gear and collect powerups during each play.